JICA assists and supports developing countries as the executing agency of Japanese ODA. In accordance with its vision of “Inclusive and Dynamic Development,” JICA supports the resolution of issues of developing countries by using the most suitable tools of various assistance methods and a combined regional-, country- and issue-oriented approach. Since joining the Colombo Plan in 1954, Japan has been providing financial and technical assistance to developing countries through ODA, aiming to contribute more proactively to the peace, Stability and prosperity of the international community. JICA is in charge of administering all ODA such as technical cooperation, ODA loans and grant aid in an integrated manner, except for contributions to international organisations. JICA, the world’s largest bilateral aid agency, works in over 154 countries and regions and has some 90 overseas offices. The private sector serves as the driving force for economic growth in developing countries. Strong and comprehensive economic growth can be realised when private companies in various fields, including SMEs, achieve dynamic growth and development and create higher added value. The Yokohama Declaration 2013 that was adopted at the Fifth Tokyo International Conference on African Development (TICAD V) in 2013 focused on the theme “Promoting Private Sector-Led Growth.” Assistance measures by the Japanese government also include Boosting Economic Growth (private sector and trade/investment). In the TICAD VI, the Nairobi Declaration which identifies Promoting Structural Economic Transformation through Economic Diversification and Industrialisation, as one of priory area was announced in 2016. Responding to the increasing importance of developing countries in the world economy, Japanese companies, particularly manufacturers, have actively established operations in developing countries in recent years by finding new markets and opening manufacturing bases in those areas. Through further reinforcement of collaboration with those companies, JICA focuses on realising more effective development support and contributing to enhancing the mutually beneficial economic relations between Japan and those countries. More information on private sector development can be found on JICA’s website. JICA’s work through public-private partnerships is summarised here. 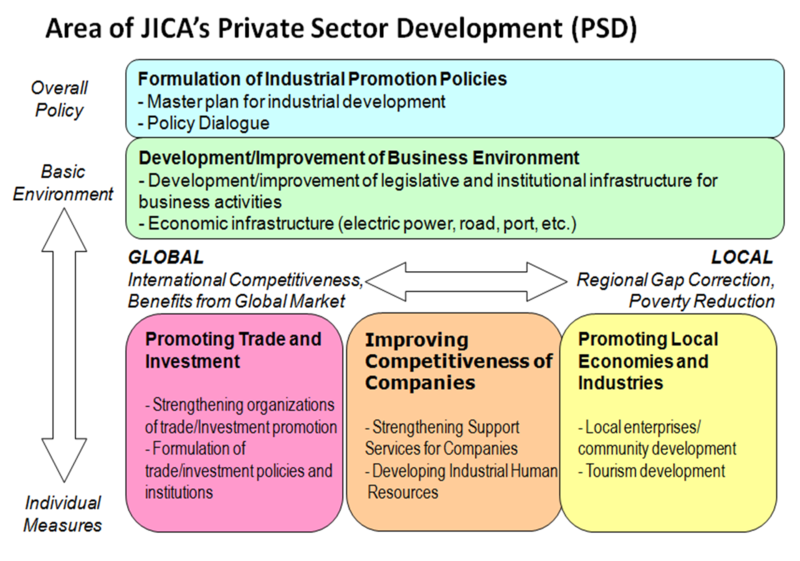 While a wide range of factors, including macroeconomic stability, infrastructure development, and improved basic education, constitute important elements of private-sector development, JICA focuses on the following fields: (1) developing policies and institutions for improving the business environment; (2) promoting trade and investment; (3) improving the competitiveness of companies; and (4) promoting local economies and industries. JICA assists with policy and institutional development so that developing countries will be able to achieve an environment conducive to the activities of private companies and realise the development of industries that serve as an engine for development. Industrial promotion policy is a principal pillar for national development in developing countries. JICA’s assistance in drawing up industrial policies focuses on various aspects — promoting trade and investment, improving the competitiveness of companies, or promoting local economies and industries — depending on the situation in the partner country. In fiscal 2014, JICA continued supporting the industrial policy planning process of Ethiopia by holding industrial policy dialogue with the prime minister and other decision-makers. It also dispatched experts to Timor-Leste to assist in drafting industrial policy documents and to Cambodia to assist in developing a basic framework for an SME promotion policy. In Myanmar, JICA also provided training for government administrators in charge of industrial promotion to bolster policy implementation structures. JICA assists with the development and operational improvement of legislative and institutional infrastructure for business activities, including economic laws such as the enterprise law and the competition law, intellectual property systems, standards and conformity assessment systems (standardisation, certification, and measurement standards), tax administration, and financial systems. For example, JICA has sent experts to Indonesia, Viet Nam, and Myanmar for assisting in building the systems for protecting intellectual property rights such as patents and trademarks. The field of trade and investment focuses on benefiting from economic globalisation. In direct investment in 2014, 55.5% of investment went to emerging and developing countries; thus, developing countries are becoming even more attractive as an investment destination for foreign companies. There are moves on the part of developing countries to take advantage of foreign direct investment (FDI) as an engine for economic growth and to promote domestic industries by developing supply chains in cooperation with foreign companies. To attract FDI, developing countries need to address two challenges: (1) “improvement of the investment environment” by, for example, streamlining investment procedures and removing barriers to investment; and (2) “enhancement of investment promotion functions,” including active dissemination of investment opportunities information. JICA dispatches investment promotion advisors mainly to Asian and African countries to help them address these challenges. In recent years, the development of special economic zones and industrial parks in developing countries is drawing attention. Such zones and parks are designed to offer an attractive investment environment — intensively built infrastructure, preferential treatment, and accessible services — so that foreign companies will use them as a foothold for their operations in these countries. In fiscal 2014, JICA launched assistance to support capacity development for the Thilawa Special Economic Zone (SEZ) Management Committee in Myanmar as well as the formulation of SEZ development plans and capacity development for the implementing agency in Bangladesh. In India and other countries, JICA is also engaged in improving the investment environment under its development policy loan program, which is aimed at reforming and improving the policies and institutions of developing countries’ governments. Imports and exports of emerging and developing countries account for 40.3% in export value and 39.6% in import value of total global trade in 2013. It is obvious that trade plays an important role in economic development in developing countries. For furthering trade, it is essential to simplify and facilitate trade-related procedures, including customs, as well as to improve access to foreign markets by companies in developing countries. JICA provided support for facilitating trade procedures by modernising customs in Viet Nam and Myanmar. It also supported functional improvement of the Directorate General for National Export Development, Ministry of Trade in Indonesia. In fiscal 2014, JICA launched a project in Ethiopia aimed at promoting the branding of local products to differentiate them from competing products. JICA is engaged in strengthening support services for companies and developing industrial human resources to improve the competitiveness of companies, especially SMEs, which account for the predominant proportion, that support economic growth in developing countries. From the point of view of heightening the competitiveness of companies, assistance could be provided addressing management resources within companies: labour, technology, capital, and information. Because assistance in these areas, which is aimed mainly at SMEs, tends to be provided through intermediary public/private support organisations, much of JICA’s assistance targets improving the functions of these support organisations. In fiscal 2014, JICA helped with the development of SME support systems in many countries. For example, it assisted both in strengthening SME support networks in Thailand and in introducing an SME mentor system in three Balkan states — Serbia, Bosnia and Herzegovina, and Montenegro. In Indonesia and the Philippines, JICA’s support for groups of enterprises/producers, such as industrial clusters, contributed to capacity development, improved coordination, and better performance. JICA is also spreading the use of Kaizen methodologies for quality and productivity improvement, one of the areas of Japan’s greatest competency. In consideration of TICAD V, this effort has been strengthened especially in Africa. JICA provided cooperation for private sector development in Ethiopia, Ghana, Tanzania and Zambia in 2014, pursuing further mutual collaboration in this field. Assistance for developing industrial human resources focuses on measures to boost the competitiveness of companies utilising Japan’s know-how in this area. JICA cooperates with government institutions, educational institutions, and other entities in various countries that provide such support for human resources development. The goal of the cooperation is to enable companies to acquire and improve the know-how necessary for business activities, such as business and production management and manufacturing technology. The results of this type of cooperation can mutually benefit both the developing country and Japan. It contributes to the development of the manufacturing industry in the developing country and to the business activities of Japanese companies operating locally. For example, JICA shares Japanese manufacturing techniques with India and assists in nurturing potential leaders who will play a central role in achieving sustainable development of the manufacturing industry. As visionary leaders, they are expected to play a leading role in developing Indian industries and serve as business partners for Japanese companies who understand Japanese ways of thinking. This will likely help expand business between the two countries. Particularly notable in this field are the Japan Centres for Human Resources Development (Japan Centres). JICA is establishing Japan Centres in Cambodia, Laos, Myanmar, Viet Nam, Mongolia, Kazakhstan, the Kyrgyz Republic, Uzbekistan, and Ukraine as focal points for its efforts in nurturing industrial human resources in developing countries. Through the Business Training Programs that form the core of their operations, the Japan Centres nurture human resources that are specialised in Japanese-style management and production management methods. In recent years, alumni reunions actively work on creating networks among the local industrial workforce. Utilising the know-how and networks built up over the many years of the Business Training Programs, JICA is also providing support and cooperation to Japanese companies doing business in these local markets. As the economies of developing countries grow, regional disparities have become a major issue in an increasing number of developing countries. In order to spread the benefits of economic growth widely to local residents, JICA supports industrial development benefiting local areas by effectively utilising the special characteristics and resources of local areas. In many countries, including Malawi, the Kyrgyz Republic, Colombia, and Kenya, for example, JICA helps create a system whereby small enterprises that produce processed agricultural products and handicrafts and their associations can expand their business on their own. Specifically, JICA assists in developing a mechanism for providing guidance and advice on various issues such as basic business knowledge (accounting, etc. ), exploration and utilisation of local resources, improvement of quality and productivity, food sanitation, packaging/design, and marketing/sales promotion. This effort contributes to creating attractive products. JICA cooperates in the tourism field in countries, such as Mozambique and Bosnia and Herzegovina, by providing assistance for coordinated efforts and collaboration by the public and private sectors. JICA cooperates with advertising and promotions for targeted tourists and with developing tourism products that make use of the special characteristics of local resources and thus benefit the region. Tourism projects in Jordan and Ethiopia emphasise the concept of preserving, displaying and utilising the tourism resources including local nature, culture and ways of life, in a sustainable and unified manner with local people. To materialise this concept, JICA is supporting capacity development of public and private stakeholders and strengthening of collaboration among those stakeholders.